Yooralla can assist you to find accommodation with a level of service and support best suited to you. Yooralla has more than 60 residential houses across Victoria (metro and regional), designed to suit the needs of people with disability. Our residential options include a mix of community units, villas, group homes, transitional accommodation and individual accommodation in self-contained flats. Most of our accommodation is located in suburban streets close to public transport, shops and community facilities. Our houses meet accessibility requirements and are fitted with assistive technologies and equipment. Yooralla also manages Australia’s only Ventilator Accommodation Support Service that provides accommodation and high-level 24-hour support for people who are chronically dependent on mechanical ventilation. Within our supported accommodation service, Yooralla provides you with full-time care and support. Whether you need support around the clock or for just for a few hours a day, Yooralla can work with you to design a support program that suits your needs. If you are looking for accommodation for yourself or someone you know check out our latest vacancies and see if there is something suitable. We've interviewed some of our customers to capture the stories and their experience at Yooralla's accommodation. Click on the links below to hear their amazing stories. 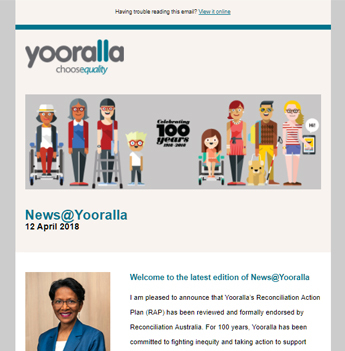 Who can access Yooralla's supported accommodation? People with disability between the ages of 18 and 65 can access our supported accommodation services. Places within accommodation options are subject to availability. We always consider the compatibility of residents in Yooralla’s accommodation options. When you let us know that you’re looking for a new home, we will consider your age, gender, health needs, interests and personal requests, to ensure you and your fellow housemates are well-suited and likely to enjoy each other’s company. We are one of Victoria’s oldest and largest disability service providers, with over 100 years’ experience in supporting people of all ages and needs. We provide flexible services, customised to support everyone’s needs. We uphold the highest standards of quality and safeguards. We actively promote and uphold the fundamental rights of people with disability as equal citizens. Our staff are experienced, qualified and highly trained and have extensive experience supporting high and complex needs. Our recruitment process includes thorough interviews, national and international police checks, and Working with Children Checks where relevant. We meet sector quality certification and legislative requirements.